Love this look! I'm going to start knotting more of my tops now. I wish I could pull off a top knot like you, beautiful! *blushing* Thank you so much Carmen, you're so sweet! Wishing you a lovely weekend too lady! Meghan, just gorgeous! Love the leather skirt! So sharp!! Amazing look!! Love your blog dear!! Very cute! 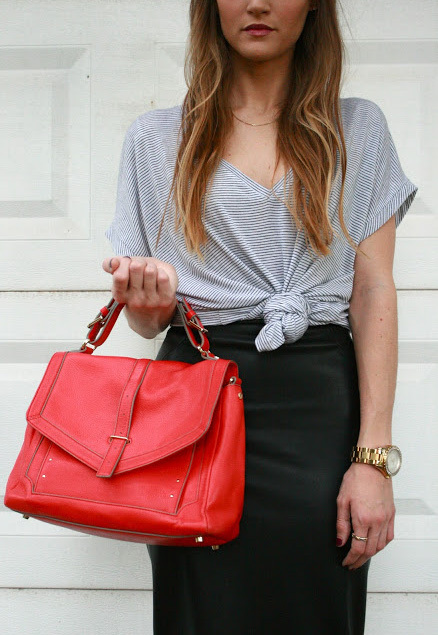 Plus I love the touch of color with the addition of that red bag! You look gorgeous! I love your hair and that skirt is perfection! Really love this style! So cute to match your hair! Hope you had an excellent weekend! Loving this from hairstyle to the shoes, top to bottom amazing!! Loving how you styled the skirt! Love this chic look and the double-knot action! This skirt is a great piece! The shoes are also really pretty! Have a nice week! That top is just perfection! Love the pop of color! This makes me miss my long hair! I like be your updo and heels!